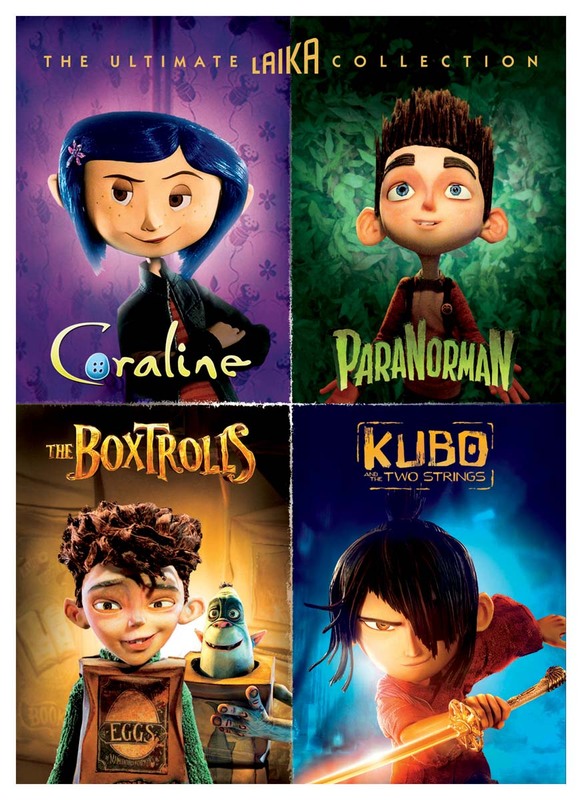 Four-disc set includes:Coraline (2009)Woe is poor Coraline Jones (voiced by Dakota Fanning)! With her parents too busy to pay attention to her, the precocious young girl ventures through a tunnel in their new house and finds an odd parallel world where Other Mother and Other Father dote on her and invite her to stay...if she's willing to pay the dark, bizarre price. Director Henry Selick's ("The Nightmare Before Christmas") beguiling animated fantasy, based on the Neil Gaiman novel, co-stars the voices of Teri Hatcher, Ian McShane. Not in 3D. 101 min. C/Rtg: PGParaNorman (2012)Computer-animated family film introduces you to Norman, a boy living in a small New England town who is able to speak with the dead. Unable to convince his family or other members of the community about his ability, Norman is ostracized until he is befriended by the eccentric Neil. Together, the boys attempt to perform a ritual to save their home from a curse placed by a condemned witch centuries ago. With the voices of Kodi-Smit McPhee, Anna Kendrick, John Goodman, Elaine Stritch. 93 min. C/Rtg: PGThe Boxtrolls (2014)Beneath the tiny, curd-obsessed town of Cheesebridge dwells a race of carton-clad trolls who scavenge everything--and who've raised the human foundling they named Eggs (voiced by Isaac Hempstead Wright) as one of their own. When exterminator Archibald Snatcher (Ben Kingsley) vows to rid the community of the blight, Eggs has to bridge the gap between his worlds. Stop motion-animated charmer also stars Elle Fanning, Jared Harris, Nick Frost, Tracy Morgan. 97 min. C/Rtg: PGKubo And The Two Strings (2016)In feudal Japan, one-eyed, 11-year-old Kubo (voiced by Art Parkinson) had the uncanny ability to bring origami to life by playing his lute...and a shrouded past that his infirm mother kept from him. When he finds himself determinedly chased by malevolent mystic beings, he joins with sardonic simian Monkey (Charlize Theron) and bumbling samurai Beetle (Matthew McConaughey) on a quest to explain his uncanny origins. Remarkable stop-motion animated fable from Laika studios also features the voices of Ralph Fiennes, Rooney Mara, Cary-Hiroyuki Tagawa, and George Takei.